The Latin American Economic Development Association, Inc. (LAEDA) was incorporated in New Jersey in 1987 as a nonprofit, 501 (c) (3) tax-exempt corporation. The organization was established through the efforts of the National Puerto Rican Coalition along with local community and business leaders to create economic opportunities for minorities while facilitating the redevelopment of Camden City. 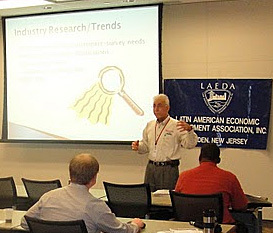 LAEDA is a successfully governed and managed minority enterprise. LAEDA is a non-profit economic development organization dedicated to the creation of small business ownership opportunities for all minorities, to contribute to the growth and success of small businesses and the development of the marketplace in the communities we serve. LAEDA is governed by a committed Board of Directors from throughout its program service area. Under the leadership of Mariluz Gonzalez, these professionals and community stakeholders strive to ensure that LAEDA has the vision and resources to develop programming and initiatives that empower individuals and revitalizes communities. Learn more about LAEDA and its programming by visiting the Programs and Initiatives page. Want to see how you can help? Visit our How Can I Help? page.